Tissot has been crafting Swiss watches since 1853. The father and Son team of watch makers was the first to mass produce the pocket watch. This was just one of many firsts, which the company would experience. From there, Tissot became the first maker to craft a watch from plastic, rock, wood, and Mother-of-Pearl. Yes, Tissot is still an innovative force to be reckoned with. For many years, the company was making watches, primarily for men. As a matter of fact, 85% of their production was in men’s timepieces, but in 1998 the watch makers took off in a different direction. The T-Collection for women was launched, and was met with great appreciation. It seems as though the timing was right to open up to the world of women’s sport watches. The Tissot Women’s T-Classic is one of their most traditional designs. It is crafted from polished stainless-steel, and offers clean lines and sophisticated appeal. The feminine sizing is smaller, yet not so delicate that it loses its power. It is a highly accurate Swiss Quartz model, which is water resistant to 50 meters. It features a Mother-of-Pearl dial and silver accents. The most attractive aspect of this timepiece, is the price…it retails for $220.00. A great price for a quality Tissot watch. 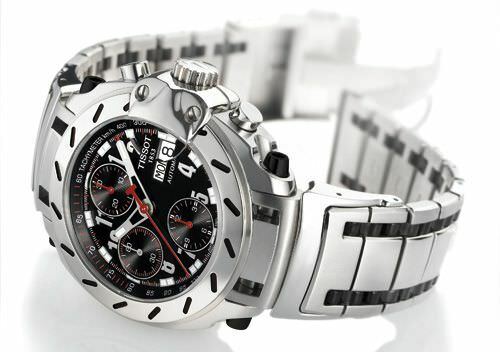 If excellence and quality are what you’re searching for, Tissot is the place to look. Tissot’s Swiss precision quality is known worldwide. The accuracy of their timepieces is what makes Tissot a force to deal with in the watchmaking industry. Tissot stands behind their products, offering a full two year warranty on any item purchased from an authorized Tissot dealer. The use of strong, durable materials, such as Titanium, PVD, stainless-steel, and 18 carat gold ensure the long life of these watches. The inner workings of these Swiss made marvels, and the innovative technology that Tissot has developed over the years, ensure that a Tissot timepiece will tick on and on. Down to the tiniest detail, Tissot tests their products for strength and durability. The leather straps are tested to make certain no color transfer takes place under wet conditions. The strength of the stainless-steel and PVD bracelets are checked under stressful conditions. Even the movements are put through strenuous tests and must be able to withstand up to 10,000 oscillations without incident. When all the testing is over, and the final timepiece is produced…you can rest assured that the end result will be excellent! The care that Tissot takes in designing and crafting their watches give me confidence in their brand. Discover Tissot, today. Tissot is world famous for their fine watches. They have a huge fan-base and world-class Ambassadors, like 2006 MotoGP World Champion, Nickey Hayden. In 2009 Nicky switched gears from Honda, and teamed up with Ducat racing. Tissot is proud to have had Nicky as an Ambassador for over four years, now and wishes him much luck in his MotoGP racing career. The special timepiece created for Nicky, is the T-Race(Nicky Hayden 2009). This super-sharp watch comes in a jet black and fire red combination. It is a large gentlemen’s size, measuring 43.5 mm. and weighing 124 grams. The case is crafted of stainless-steel and carbon. It features a black carbon index dial, with a motocross patterned face. The bracelet is a vibrant red rubber. The mix of colors and different materials give the T-Race a definite edge. But looks are only part of this story. This watch is highly-functional, too. Under the hood of this instrument is all Swiss Quartz precision. It is a perfect match to Nicky’s personality…energetic and dynamic! Tissot has been crafting quality Swiss watches for decades and doing it successfully. Combining all of their innovation and technology, and mixing that with design…Tissot ends up in the winners circle. The T-Race may not win races for Nicky Hayden, but it sure will look great on his wrist, when he does. Tissot Watch Company celebrates its 150th birthday. A premier Swiss watchmaker since 1853, Tissot continues with the tradition of quality that keeps them ticking. Tissot watches are best known for their innovative styles which continue to delight us today. I have a couple of favorite designs for men. The Tissot Quadrato is a handsome watch with bold features. The Quadrato is all stainless-steel, with a square dial. I love the functionality of this watch, with day, date and chronograph design. This watch is elegant and contemporary. Another great choice is the Tissot Gold pocket-watch. Tissot was the maker of the first production pocket-watch back in 1853 and the gold version continues to make a sophisticated statement today. It has character and exudes old-world charm. I love both of these watches. They exemplify innovation and tradition, which is what Tissot is all about. Keeping up with the times, while remaining true to the highest quality craftsmanship has produced long-term success. Tissot watches continue to impress me, and their styles made of pearl, wood, even rock…show their dedication to design excellence. Despite the economic crisis and all the naysayers who believe that luxury products are on the way out, Tissot Watches is one company that continues to innovate. The company has been very actively pursuing the Nascar Audience with its Pit Precision Award, but their most popular consumer watch is the T-Touch Platinum. This exciting new timepiece brings together all the capabilities consumers have come to expect from their other “touch-sensitive” devices, like iPods and cell phones. But there are some other unique characteristics that make these watches different from other Tissot watches. First of all, the case is made from precious Platinum 950, and the crown is made from a tactile sapphire crystal. By touching the crystal, wearers can use the watch’s “thermo mode” to get the exact outdoor temperature in either Fahrenheit or Celsius. It also includes a barometer function which allows the user to become aware of any major changes in atmospheric pressure. These extremely useful functions have made Tissot Watches even more marketable, especially to men who love “gadgets”. Tissot Watches will be introducing more watches with a touch-screen, and even greater functionality in future collections. The new T-Touch Platinum has the beauty, functionality and gadgetry to make it a top seller for the company. They’ve come to be known as “auto watches” – luxury watches that are born from a partnership with a luxury automobile brand or racing event. The thinking goes that if someone can afford to drive a high end, limited production automobile, that person is also game to buy the specially made, limited edition watch that “goes with” the car. Most likely watch and automobile aficionados will see more of these “auto watches” at the BaselWorld show in March of 2010. Founded by a father and son team in 1853, Tissot introduced the first mass-produced pocket watch during that same year. Tissot has steadily maintained their reputation as one of the most leading-edge watchmakers in the world, being the first company to make watches out of plastic, wood, rock and mother-of-pearl. Tissot is always on the leading edge of technology and innovation. From sporty watches like the popular T-Touch collection to more elegant timepieces like the men’s Quadrato Chronograph and the racy PRC 100 Dainca Patrick Limited Edition watches, Tissot is always on point. 2009 is proving to be a good year for Tissot. They have launched a series of hot, new ads featuring brand spokeswoman Danica Patrick, a new Sea T-Touch watch and upgrading already successful designs. Take the recently released Limited Edition Heritage 2009 designs for example. There are two versions within this new Heritage edition: an 18K rose gold model of which only 333 watches were produced and a stainless steel model of which 3,333 pieces were manufactured. These new Limited Edition Heritage watches take their inspiration from the 1940’s. They are classically designed and matched with a brown crocodile strap; both versions are rich in elegance, especially the rose gold one. A 38mm face, set on a black dial, shows intricate gold markings; the even numbers are boldly marked. Both versions are chronometers and were tested over many days, in many positions and within varying temperatures to make sure they can withstand the standards of quality that Tissot watches promise. With these new Limited Edition Heritage watches, Tissot’s motto of “innovators by tradition” has added two more collectible timepieces to the world of luxury watches.